RVnGO is America's best marketplace to find RVs to rent in Nevada. Find your RVnGO! Once called the Boulder Dam, Hoover Dam is a marvel of engineering. Development started in 1931 and finished in 1936. The dam is located inside Boulder city and it manages the Colorado River producing water control for Nevada, California, and Arizona. Travel trailer rentals in Nevada are only permitted to stop in the stopping zones on the Arizona side of the dam. Astonishing to see, a guided tour will make you fully appreciate the power it provides. The Hoover Dam is a standout amongst the greatest building accomplishments in our country's history and merits a visit in your RV rental Nevada! Las Vegas is a unique place to visit, with its incredible array of modern architecture and amusements. The Freemont Street Experience is a pedestrian promenade covered with the world's largest video screen in the area of older downtown Las Vegas that offers a different pace than the strip. Guests can see incredible free light shows, tune into musical performances, zip line over the street performers and tourists, as well as see classic icons like Vegas Vic and the Golden Nugget. 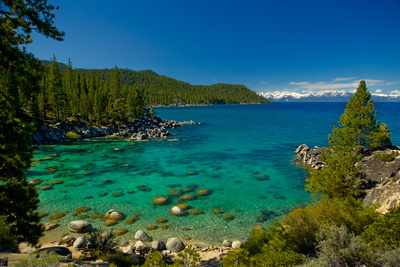 Lake Tahoe is the largest freshwater lake in the Sierra Nevada Mountains, at 6,000 feet above sea level, it straddles California and Nevada. Its cobalt waters can be up to 1,000 feet deep and it has approximately 71 miles of shoreline. Guests flock to this lake year-round for majestic scenery and open-air recreational activities. Winter sports are exceptionally close to Lake Tahoe, and amid the hotter months the water is a refreshing way to cool off. Las Vegas is known for its amusements and amenities, and the Oasis Las Vegas RV Resort is no exemption. It has 350 accessible full hookup spots with yards and space for slideouts for a RV rental Nevada. Services include a heated pool, whirlpool, recreational area, game room, exercises classes, miniature golf, putting green, open-air games, horseshoes, eatery, lunch room, supplies, RV stockpiling, ATM machine, laundry area, wi-fi web get to, satellite TV and restrooms and showers for your travel trailer rentals in Nevada. Guests can stay at the Oasis Las Vegas RV Resort at any time of the year. Drive your RV rental in Nevada to Las Vegas and camp at the Hitchin' Post RV Park. Only a couple of minutes from the core of the city and the NASCAR track, it has 98 accessible full hookups with tables and space for slideouts. Services include wi-fi, digital TV, game room, heated pool, putting green, driving range, horseshoes, bar, eatery, ATM machine, RV stockpiling and supplies, nearby RV administration, restrooms and showers, laundry, and controlled gate. Appreciate Hitchin' Post RV Park's vicinity to different attractions throughout the entire year! Shamrock RV Park is a couple of minutes from the downtown zone of Reno, perfect place to luck out on your Nevada RV trip. With fabulous views of the Sierra Nevada Mountains, it has 60 accessible full hookups with yards and space for slideouts for your camper rental in Nevada. Services and conveniences include wi-fi web access, digital TV, heated pool, game room, RV supplies, laundry area, restrooms and showers, and visitor administrations for camper rentals in Nevada. For a mind-blowing experience, take your RV rental in Nevada to Burning Man Held in Black Rock Desert in late August to early September, it is one of the greatest counterculture events in the nation. A one-week long celebration, it is an atmosphere of possibility focused on radical craftsmanship, self-reliance, artistic empowerment, and communing with other free spirits. A network of dreamers and doers are urged to engage in a vibrant metropolis through creative expression. It includes live musical exhibitions, architectural wonders, and guerrilla road theater. Burning Man is a highly intricate endeavor which needs serious research and advance preparation, but truly an adventure of a lifetime event to attend. One of the nation's chief whitewater events, the Reno River Festival, is held at the Truckee River Whitewater Park in Reno each mid-June. It is an activity-filled weekend occasion, displaying the best kayakers from throughout the world. The celebration highlights proficient and novice rivalries, whitewater facilities, mountain bike speed trials, a handoff race, live musical performance, and heaps of food and beverages. You can also find the most recent riggings and clothing at the expo. Enjoy the rapids and more at the Reno River Festival. Your days or weeks will be loaded with fun spots to tour and exciting encounters when you visit Nevada. Rent a RV trailer to Nevada and take a road trip with the whole family! Much obliged to you for picking RVnGO for your RV rental needs!